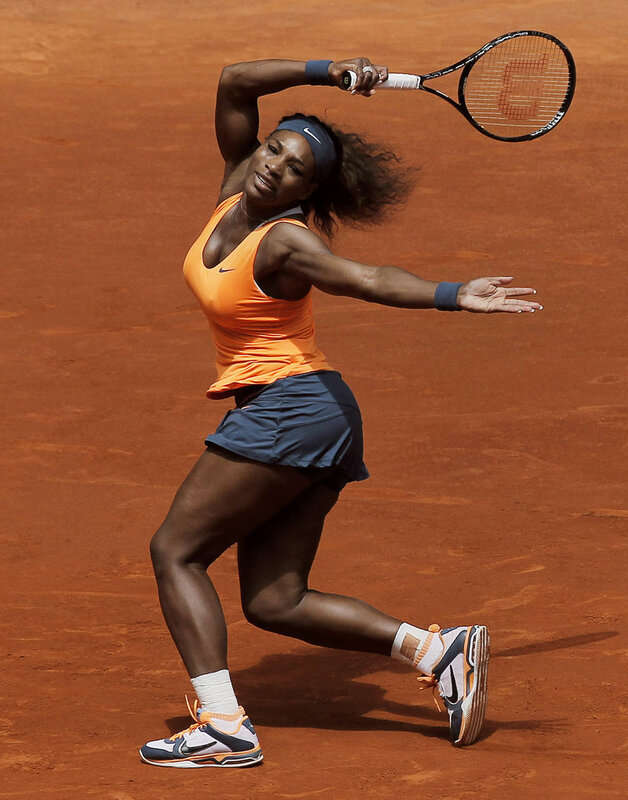 Those who ought to know say Serena Williams is the top female player ever, despite troubles in Paris. PARIS – In the moments immediately following her stunningly early exit from the 2012 French Open, as her eyes welled with tears and she bemoaned how she’s “been through so much in my life,” Serena Williams could not possibly find anything positive to take from the experience. For the first and so far only time in her career, Williams lost her opening match at a Grand Slam tournament. Not merely that, but a woman many considered the favorite to leave with the title lost to a woman ranked 111th and with 20 first-round losses in 46 previous major championships. And surely adding to her disappointment, Williams lost after having been two points from victory against France’s Virginie Razzano. When the 31-year-old American returns to Court Philippe Chatrier to play Anna Tatishvili on Sunday — the schedule for Day 1 of the 2013 French Open also features Williams’ older sister, 30th-seeded Venus, and 17-time Grand Slam champion Roger Federer — she will do so with a different understanding of what went wrong 12 months ago, and even a bit of appreciation for the disappointing result. There are, to be sure, other explanations for what she has done on the court since that defeat: good health, which her mother, Oracene Price, calls the biggest single contributor to Williams’ recent success; working with a new coach, Patrick Mouratoglou, who directed her training session Saturday on Court Suzanne Lenglen; and what Williams sums up as “really just staying relaxed and calm” during matches. But it certainly can’t hurt to take every match seriously, including against players such as Tatishvili, who is 2-10 this year, 0-2 at the French Open for her career and never been ranked better than 50th. Evert thinks Williams will eventually surpass that total, and continue climbing up the list that Margaret Smith Court leads with 24 major championships, followed by Steffi Graf’s 22 and Helen Wills Moody’s 19. It’s that serve that might very well be Williams’ greatest advantage over her contemporaries. She leads the tour this season in most significant serving categories: 227 aces, nearly 80 more than the next-highest count; 85 percent of service games won; 77 percent of first-serve points won; 68 percent of break points saved. Williams still seems to bring out her most compelling tennis when across the net from the game’s other top women: She is a combined 25-4 for her career against current No. 2 Maria Sharapova, the French Open’s defending champion, and No. 3 Victoria Azarenka. That includes a 6-1, 6-4 victory over Sharapova in Madrid, and a 6-1, 6-3 victory over Azarenka in Rome — both in finals, both this month, and both on the same red clay used in Paris. Now the question becomes whether Williams can carry that over to Roland Garros, where the tough footing and shot-slowing surface give her far more trouble than the grass or hard courts used at other Grand Slam tournaments. While she’s won Wimbledon and the Australian Open five times apiece, and the U.S. Open four times, Williams is stuck on one French Open title. That’s also her only appearance in the final. She hasn’t even made it to the semifinals in France since the year after that, a decade ago. “It’s long overdue, her second French Open win,” Evert said.